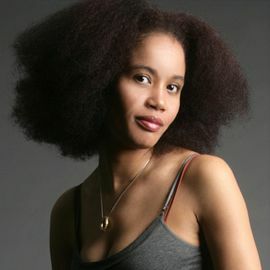 Staceyann Chin is a spoken word poet, performing artist and LGBT rights political activist. Her work has been published in the New York Times, the Washington Post, and the Pittsburgh Daily, and has been featured on 60 Minutes. She was also featured on The Oprah Winfrey Show, where she shared her struggles growing up homosexual in Jamaica. Chin was born in Jamaica but now lives in New York City, in Brooklyn. She is of Chinese-Jamaican and Afro-Jamaican descent. She announced in 2011 that she was pregnant with her first child, giving birth to a daughter in January 2012. She has been candid about her pregnancy by means of in-vitro fertilization, and wrote about her experiences as a pregnant, single lesbian in a guest blog for the Huffington Post. Openly lesbian, she has been an "out poet and political activist" since 1998. In addition to performing in and co-writing the Tony-nominated Russell Simmons Def Poetry Jam on Broadway, Chin has appeared in Off-Broadway one-woman shows and at the Nuyorican Poets Cafe. She has also held poetry workshops worldwide. Chin credits her accomplishments to her hard-working grandmother and the pain of her mother's absence. Chin's poetry can be found in her first chapbook, Wildcat Woman, the one she now carries on her back, Stories Surrounding My Coming, and numerous anthologies, including Skyscrapers, Taxis and Tampons, Poetry Slam, Role Call, Cultural Studies: Critical Methodologies. Chin's voice can be heard on CD compilations out of Bar 13- Union Square and Pow Wow productions. In 2009, Chin published her autobiographical novel, The Other Side of Paradise: A Memoir. She is a host on Logo's After Ellen Internet show, "She Said What?" and a co-host of Centric's "My Two Cents."